Over the years my backpacks have been dropping in size. I began with an 80-liter Gregory Shasta, then moved to a 65-liter Zulu. Dropping further, I purchased a Gregory 55-liter Z Series pack. This 55-liter Z Series became my go-to backpack. It was light, and offered enough room for an extended trip. Then, one day I spied the new Gregory Zulu 40 in Burnished Orange. I was quite smitten. The color was beautiful, and I was already sold on the Zulu design. From REI, the pack cost $133.73 (size, large). I was a bit hesitant to pay that much for a pack that I probably wasn’t going to use much – but the color kept drawing me back. Finally, I pulled the trigger. Soon, I would discover how wrong I was: this pack would get some use. In May 2018, I completed a 10-day backpacking excursion, hiking over 140 miles (143.7 miles to be exact, but who’s counting?). I never expected to be able to take the Zulu 40 on such an extended trip. However, as I began to pack it I realized once again how wrong I would be: this pack would make the journey. Now, just to be clear, I did not take all 10 days worth of food with me. Rather, I resupplied after 6 days. I do not believe this pack would have efficiently carried all 10 day’s worth of food. It is designed to carry only around 35 lbs. In a word, the pack performed as beautifully as it looks. The padding in the shoulder harness and hip belts kept me from chaffing and soreness. 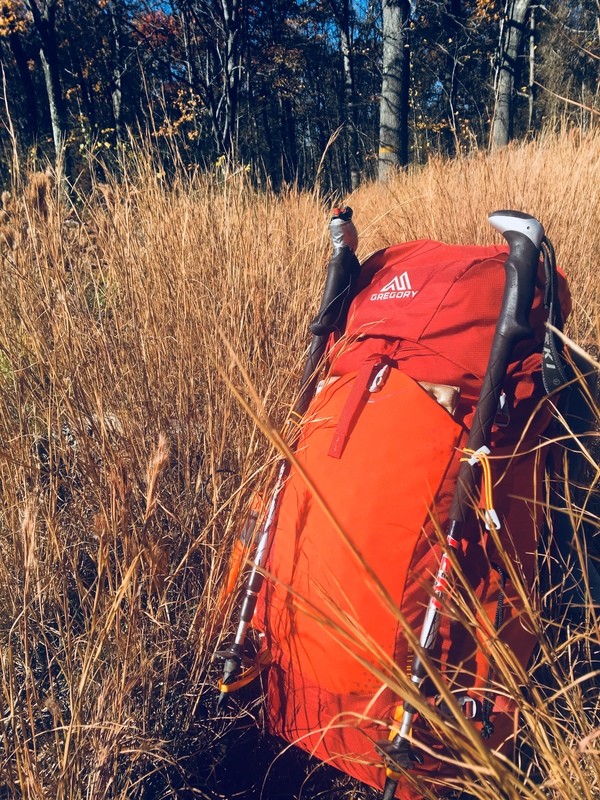 I found the pack to be amazingly comfortable, even when I hiked my longest day (24 miles). The pack is top-loading, with a non-removable cap. The cap has an outside zippered compartment, and one on the inside. It has a handy key chain inside the hidden compartment to stow away your car keys until you return from your adventure. The pack comes with mounting straps to hold your trekking poles (shown in picture above). It has two water bottle pouches. However, as I pointed out in my video, I found it nearly impossible to retrieve and replace water bottles into the side pouches. Instead, I used a hydration bladder, which the pack is designed to accommodate. My biggest criticism of the Zulu 40 is the belt size. I ordered the Large sized backpack for my torso length. The hip belt that it comes with is a bit large for my 31″ waist. After tightening it up, I discovered that I was out of length: I couldn’t tighten it anymore. I would have preferred to tighten it up a bit more. If you have a waist size smaller than 31″, and wear a large-framed backpack, you may have trouble getting this one cinched up. The belts cannot be swapped out. My final criticism is the advertised weight of this backpack. It is being listed at 2.86 lbs. Without the included pack cover, mine weighs in at 3.25 lbs. I am not sure where Gregory is getting the 2.86, unless they are weighing a small or medium. However, from the website, I was lead to believe I would be getting a slightly lighter backpack. All in all, I love this backpack. Knowing that I can take it for extended, three-season trips, it has become my new go-to pack. And I still am in love with the color.